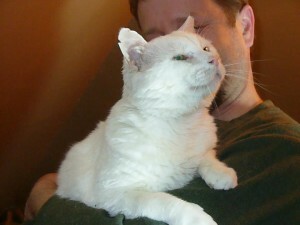 Last week our 16-year-old FIV positive boy Cash was not looking well so we hauled him to the vet for a thorough check. The good news is his blood work looked great, especially for an FIV cat his age. The bad news is he has a food allergy and now requires a more expensive limited ingredients food to stay well. We have many special needs kitties like Cash who are FIV or FeLv positive, are seniors, or who have other special needs. If you would like to sign up for monthly giving to help sponsor our special needs cats, you can do so with any amount that fits your budget. Simply go here and scroll down to the monthly giving options.